In a Scientific American essay based on their new book A Grand Design, Stephen Hawking and Leonard Mlodinow are now claiming physicists may never find a theory of everything. Instead, they propose a "family of interconnected theories" might emerge, with each describing a certain reality under specific conditions. Most of the history of physics has been dominated by a realist approach. Scientists simply accepted that their observations could give direct information about an objective reality. In classical physics, such a view was easily defensible, but the emergence of quantum mechanics has shaken even the staunchest realist. In a quantum world, particles don't have definite locations or even definite velocities until they've been observed. This is a far cry from Newton's world, and Hawking/Mlodinow argue that - in light of quantum mechanics - it doesn't matter what is actually real and what isn't, all that matters is what we experience as reality. As an example, they talk about Neo from The Matrix. Even though Neo's world was virtual, as long as he didn't know it there was no reason for him to challenge the physical laws of that world. Similarly, they use the example of a goldfish in a curved bowl. The fish would experience a curvature of light as its reality and while it wouldn't be accurate to someone outside the bowl, to the fish it would be. This view is a staunch reversal for Hawking, who 30 years ago argued that not only would physicists find a theory of everything, but that it would happen by the year 2000. In his first speech as Lucasian Chair at Cambridge titled "Is the end in sight for theoretical physics?," Hawking argued that the unification of quantum mechanics and general relativity into one theory was inevitable and that the coming age of computers would render physicists obsolete, if not physics itself. Of course, Hawking has become rather well known for jumping way out on a limb with his public remarks and for decades he embraced supergravity as having the potential to solve theoretical physicist's ills, even hosting a major conference on it in 1982. However, but Hawking has never harbored allegiances to theories that describe a physical reality. So, while two well-known physicists coming out against a theory of everything is compelling, it really shouldn't seem like anything new for Hawking. "I take the positivist view point that a physical theory is just a mathematical model and that it is meaningless to ask whether it corresponds to reality. All that one can ask is that its predictions should be in agreement with observation." In "The Grand Design" Stephen Hawking postulates that M-theory may be the Holy Grail of physics...the Grand Unified Theory which Einstein had tried to formulate, but never completed. It expands on quantum mechanics and string theories. E=mc², Einstein's Special Theory of Relativity, is probably the best known scientific equation. I revised it to help better understand the relationship between divine Essence (Spirit), matter (mass/energy: visible/dark) and consciousness (f(x) raised to its greatest power). Unlike the speed of light, which is a constant, there are no exact measurements for consciousness. In this hypothetical formula, basic consciousness may be of insects, to the second power of animals and to the third power the rational mind of humans. The fourth power is suprarational consciousness of mystics, when they intuit the divine essence in perceived matter. This was a convenient analogy, but there cannot be a divine formula. Lordy, who let the bat-crazy freak in...? Methinks thou hast failed in thy task, for thou must distinguish between the kettle and the pot. Ron Krumpos, let us know when you have something to actually add to the discussion. ..... wwooww finally a scientist who cares to read a little about classical philosophy. Well guess what, that view has been around for more than 100 years. The fact that our sensed reality has nothing to do with ideas has been the recurring problem of philosophy since Plato. Now I’ve heard comments like he is getting more sick or something, well for me, it’s clearly the other way around, he is maturing, and probably the only person on earth with an integral view our sad state of comprehending nature… and that most people are far from understanding. If physicists need to believe in the "reality" and to not care about philosophical concepts, maybe it's for a good reason; That makes them enthousiastic enough to keep working on their theories. I thought the answer was 42...? hmm given time, we might be able to calculate the capacity of information processing of the universe. In essence it isnt about forces but information states. From there a general math of of how the world behaves could be derived. Much like event horizons of black holes. However we are not there yet. Also while such knowledge would explain the math involved it still wouldnt describe why it has come to existense at all. as if he had read some blog i recently posted add new scientist, there is our limit. if he reads this one too, he should wonder what connects our reality, what determines that a quantum state is bound to our reality. Can we influence it ? ?, is observation part of the mind or a pure random act itself too. Allready doublesplit experiments proves quantum world deals with multiple realities, we know we change results by observing those experiments. I have great experiment proposel to test things out. Use the schrodinger cat device not to kill cats, but to decide the change of light moment in traffic light. then what could i say (on information level) of the states my colegues arive trough the trafic jam passing those traffic lights. Can such quantum effects change our human scale world ?? would such experiment be dangerous ?? ok sofar this is a pretty weird post. it sounds all a bit strange, but some research tends to go this way altough it probaply never gets published, at the same time some things of religion go in a similair direction, some people in history had an unrealistic influence on matter.. the Neo's of the past. yup you all say i would be crazy to post this, but thats until you've seen someone levitating or something else, and might wonder this too. However, I think what Hawking and Mlodinow are trying to say is that there is true reality, it is continuing to change, and that humans will never observe it because we don't have enough time. i have a theory of everything. to say (as physics does) that time appeared 14.3 billion years ago is a circular argument (defining time's creation in terms of time). this essential paradox is crystallized thus: "what time did time itself begin"? the answer (this only meaningfully comes from a direct seeing through the paradox) is - it didn't. time did not begin. time as we perceive it is something of an illusion. in fact, time is only known in relation to time - it has no absolute nature. it's just "relative change of state" of the material world. this means that "14.3 billion years" is not really a timescale - it's a physical constant, rather like PI. if time did not begin, yet the big bang appears to be "the start of time", then perhaps it's more meaningful to say the big bang occurred an "infinite" amount of time ago? we see entropy and the arrow of time in the universe not because of the way the universe is, but because of the way WE are. a human being is a "spacetime perspective", such a construct, or identiy is forged from "emergent complexity". the dualistic opposite of emergence is entropy, these are just different sides of the same process coin. if you step back from this identification (in a satori experience) and see yourself not as emergence looking AT entropy, but as the whole coin - you actually see reality as 4D spacetime. at this point, the whole of reality exists in the "eternal Now". just as the (reversible) time equations of physics predict. the process of evolution, or emergence is an in-folding process, e.g. it "self manifests". in each emergent layer of reality, implicit evolution becomes explicit. separating process from content, if you consider this process as "pure process", and give it an infinite amount of time, it will "manifest". without violating any of the laws of physics, as hawking notes - all energy and mass in the universe cancels out, meaning in absolute terms - the "physical" universe it isn't here. so what is here? a layered process of emergence, each layer tending towards increasing concretion. but actually this layered process is bottomless - stretches to infinity. here's how it is. an infinite amount of time ago, in pure nothinness existed a totally abstract process (that of the process of emergence, or evolution). this is pure "Truth". because there is no manifestation, entropy is at 0, it's "total orderliness" (god without the messiness). at this "moment", because there is no manifestation, time (which we note is simply relative change of state of matter) is effectively infinite, because there is nothing "physical" to change - just pure process divorced from matter. so at the big bang singularity, space is infinitely small, time is infinite in rate. as the universe emerges (expands) time slows down. where we are now, time is finite and size is finite. the universe will keep expanding to infinity, at which point time will stop (entropy heat death). but because the universe has expanded to infinity, it isn't there! all matter when stretched out infinitely in all dimensions becomes "infinitely" dilute. so back to nothingness. 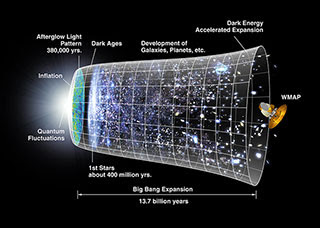 the way it "was" at the time of the big bang. the whole thing is circular, in other words. this argument breaks nondual 4D spacetime into a sequence for the sake of argument, but obviously that's not quite seeing it as it truly is. the whole thing really does all exist "at once". You were obviously having some fun there. I have to admit you made some interesting points initially but you kinda lost me a little. I don't believe in 0 or infinity, in the sense that neither actually 'exist' in reality (kinda to the point I think Hawking and Mlodinov were talking to I think so I guess I will necessarily disagree with you given that your theory seems to rely on them existing. I like to think of time as 'just another spatial dimension' but somehow under-developed or with the something squiffy about it I just can't put my finger on. It might have something to do with the fact that our understanding of anything (our 'models of reality') is inherently reliant on electromagnetism and of course electromagnetism has a relationship with the time dimension that differs from its relationship with the spatial dimensions. Regrettably we're talking about concepts that will not help us pass any 'soon to be useful' exams nor propose any 'soon to be useful' theories which is kinda why we probably have to end it here! have understanding and connection beyond ourselves. Assuming there is no God is a brazen act of stupidity since the evidence points to a designer. electromagnetism, the four pillars spoken of in the Book of Enoch (pre-flood Gospel for you neophytes of reality). growth is mediated by faith (imaginary number) and pi, the ordering of point and boundary, attraction and motion. God is represented by the 1, unity perfection, completeness. a new unity of being only if the -1 remains in balance, which this universe has fallen from through man's transgression of out will (sin). God is unremittingly pure and perfectly loving, wanting none of us to be lost when the universe is remade after transgression and death have been vanquished. Richard, the design of the universe is meant to be understood by us. That is not to say it can be fully understood; but we understand enough to begin to master it ourselves while appreciating the transcendent nature of the Creator of all this, including us who are able to contemplate it. The four forces of the universe are most likely just that - four distinct forces governing key aspects of the universe with no mandate that they be unified, no more than the condition of the earth requires that it be millions of years old simply because radio isotopes have a forward decay rate in the millions of years. Some questions do have a 'no' answer! The models for determining the age of the earth are rough and even deficient in their assumptions, as are the attempts to unify the forces of nature into a Babel-like conglomeration. could anyone who doesn't have a degree in physics refrain from posting a reply, please? Go smoke more weeeeeeeeed, maaaaaaaaaan. @tulcod I wouldn't put so much faith in a university education. How about: Those of you who don't know what your talking about or are too lazy to apply rigour, go develop skills in the arts of rigour, like mathematics and simulation. Then come back when you have built something at least somewhat correlated to reality. Wow... really people, really? Yeah the problem is people are taking bong smoking physics shots at hawking making a fairly specific claim about physics math and reading into it their own pet lay theories without being able to understand whats really being said. I'm a philosophy grad. My house mate is a physics grad. I don't even pretend to understand half of what he's rabbiting on about, and he goes glazy eyed when I start babbling about phenomenology or whatever. And thats the way it should be unless one of us bothers to actually go and studies the others specialty because our frames of intellectual reference don't have the gears and sprockets to process the information conveyed. So when some guy starts ranting about "E = MC2" and decides it can be solved by making E "soul" and C "conscciousness", its really clear he's not actually engaging with the article, just using it as a platform to sprout his own pet crank theory because the word "Theory of everything" (which is really just a hypothetical theory about how to get the math of general relativity to share its toys with with quantum physics). Unfortunately physics is as prone to crank theorization as philosophy. You get your deepak chopra types ranting about "quantum physics" with no conception at all what physicists actually claim (Thus entanglement=psychic powers, and all sorts of mumbo jumbo like that) , hadron collider=world gobbled up by blackhole , and so on and so on, just like how people come up with pet kook theories of philosophy and abuse philosophical terms to end up with the sort of illogical banalities sprouted by the likes of Ayn rand and so on. No respect at all for the intellectual hard work of people who have dedicated decades of careful reason and research for generations before them. So its not "Dont comment if you dont have a degree", its more "Your not going to solve the fundamental problems of physics just by blurting out your pet stoner theory on the comments of a physics article about a specific question almost unintelligible to folks who havent spent a *lot* of time with their heads in the books. ... and so on... a little English, maybe, somewhere down the road? There is no such thing as reality - only perception. Lately I've been pondering the idea that wave/particle duality appears as it does to us because waves oscillate through an extra spacial dimension we don't perceive, and the appearance of a particle is actually the crest (or trough, or zero-crossing point) of the wave. I was feeling like this was a fairly wacky idea until I read some of these comments. Thanks everyone. I feel you may have something there. Too bad I don't know enough linear algebra to state it mathematically. One reason we can't have a theory of everything is that we haven't observed everything. A second reason is that we make stuff up (unobserved phenomena) in order to keep the present model working. Another sign that a paradigm shift is due. To that I'll add the unreality of time as a stumbling block. No one has tried to make a physics without time, but I'm fairly convinced that when someone does, the fallout will be a clearing of many cobwebs. Science works by "making stuff up" and then testing it against reality to see if it works. At one point, the Higgs Boson was "made up" - a hypothesis to explain the concept of mass...then we made the Large Hadron Collider to test whether that hypothesis is correct - and guess what? We found actual Higgs Bosons. Sometimes the stuff we make up turns out to be real - other times it doesn't. The cycle of hypothesis ("making stuff up") and experiment ("seeing if it's real") continues with the things that do turn out to be real becoming part of our understanding of the laws governing the universe - and the things that don't pan out leading us to the interesting question of what *is* real if it isn't that. Clearing of cobwebs is what science is all about - finding that some old stuff isn't right is always an exciting and interesting thing - and that's what scientists seek. The idea that you can't have a theory of everything without observing everything is kinda silly. I can have a theory that ducks lay eggs without seeing every single duck...I see a bunch of ducks that lay eggs - I make a theory. I find a male duck that doesn't lay eggs and I refine that theory. If someday we find a duck that bears live chicks...then we'll have a new theory. At each point, the theory we have fits the facts that we know. The problem with physics and the theory of everything is that we don't even have a theory that explains everything we CAN see. If we had such a theory that could explain everything we can see - then that would be a massive leap forward. That's not to say that we wouldn't have to modify it in the future in light of further observations. Newton's laws of motion were a correct description of the phenomena that people could see in the 1700's and 1800's. Einstein "made stuff up" to postulate that there were phenomena happening at high velocities - nobody was sure he was correct until a bunch of guys hauled telescopes to the far reaches of the Earth to measure the deflection of a star during an eclipse. When that showed that Einstein's "made up stuff" was better than what we thought we knew - we tossed out Newton and crowned Einstein as the new "best-description-we-have". I don't doubt that we'll eventually prove Einstein to be incorrect - but that won't happen until we find new stuff that we haven't seen before. But that 'stuff' isn't just lying around waiting to be observed...we need folks like Hawkins to "make stuff up" - then have people with big telescopes point them at black holes - or measure the speed that galaxies are rotating to find that "dark matter" or "evaporating black hole" or whatever it is. It's not a flaw in the system - it's how progress is made - and this "Scientific method" approach has served us amazingly well. When they say "we may never..." it is effectively saying "we might, we might not", which is also saying "we don't know if we will". Its rarely interesting when someone gets up and says "we don't know". I guess in this case its only 'kinda interesting' that he's (Hawking at least) said "I don't know if we will" purely because he is backtracking on a previous claim he made where he said "we will know ( ie discover this theory of everything)". All he's doing is claiming he now believes he was wrong and he's correcting that. An honourable admission no doubt but it hardly fills you with confidence in the event you might be considering reading his earlier works. I'm not a scientist, but I would like someone to explain to me how minds that emerge from the universe, and are an interactive part of the universe (whether as observer, or participant) can "figure the universe out". How can one do that, when the very act of "figuring things out" changes everything? It seems like a great cosmic joke to me, to be trying to accomplish a "theory of everything". Don't get me wrong; we reap many benefits from the pursuit ofo questions like this, but as an end in itself? I don't think so. In essentially all cases i can think of the very act of "figuring things out" does not actually change anything about what you are studying. People study the laws of the universe because they are curious. Satisfaction of curiosity is certainly as good a reason to do something as any other. I thought that was obvious. I'm a scientist, and the same thing bothers me. If according to the block universe, Minowski space-time, Einstein's relativity, what-have-you, then you, anonymous poster, are right. Because if discoveries in science, paradigm shifts, the inventing of new technologies, and other forms of advancement in our knowledge occur in specific times along the time dimension, then NOTHING is going on. Absolutely nothing is happening. And perhaps that is the reality of reality: That no matter what you think about reality, the truth is that NOTHING is occurring, NOTHING is changing, EVERYTHING is an illusion yet at the same time Truth. So, there is this illusory paradox that makes everything problematic. This is why I think we need to figure out the scientific basis of consciousness rather than saying that an increase in dopamine equals happiness. That works from an outside observer objective, but it doesn't work well to explain reality. Yes, anonymous poster, there is a serious problem: I believe the physicists have recognized this. Considering that gravity can be observed as a warping in spacetime and not specifically a particle effect (graviton), it seems natural that this may not be able to be described in similar mathematical terms. Certainly less likely that they could be expressed in the same equation. My understanding is that you kinda still ARGUABLY need the graviton to explain the mechanics behind the 'warping of spacetime'. How does the massive object cause spacetime to warp? To warp it it needs to be made of something right? But what? Can you warp nothing? Can something exist yet be composed of nothing? Or do we have to accept spacetime as some kind of 'magical substance, like the 'ether' (accepting that all the proposed fundamental particles are effectively 'magical' at this point in time)? Without the proposed graviton its kinda axiomatic and that is where some people may intuitively have problems with it, reject it as 'non scientific and thus requiring a different model to understand it. In some senses, this is where we as humans struggle - if a model predicts future observations reliably but seems absurd to many people, will it ever be accepted as the model? Will they stop seeking alternative ones that they hope make more sense? What if two models predict things equally nicely - which do we choose? Arguably we don't need one of them but which one? Either? What if one model seemed bizarrely different in nature to many other models we had come to accept for other physical phenomenon (strong, weak, electromagnetism) yet there was one that was pleasurably similar and evocatively symmetrical - which would we choose? Its a dilemma I grant you and one we haven't yet all agreed on I think. And maybe we never will - especially if that bloody meteorite hits. Actually.. I think Hawkins answered that question precisely. "If two models agree with observation, neither model can be considered more real than the other. A person can use whichever model is more convenient in the situation under consideration." "If two models agree with observation, neither model can be considered more real than the other. A person can use whichever model is more convenient in the situation under consideration." Consider this and see whether it applies in all instances. I was gonna post something then I saw that post that said that only physicists should post, and I found it funny and somewhat true. I've been thinking for a few years that we might never understand the universe completely because a) we are "inside it" (so we cannot see beyond it's "start") and b) because the path that science has taken in the last centuries seems to be somewhat limited. I'll try to explain this without beeing accused of wanting to introduce "holistic" or eastern philosophies into play. I (think) I fully understand why science needs to rely (and build) on stuff like logic, math, physics etc. You needs to be able to prove, measure, deduct and reproduce. And these seems to be the only tools avaialable now. Sitting under a tree and thinking of stuff MIGHT get you closer to the truth but it won't provide anything that OTHERS can use and understand. As a more applied example: how do we actually know that keeping on digging for "particles" gives us the truth and not some mathematical model that only works because we keep on using it. I tend to think we model our results and interpret our information based on what we are trying to find. And we use tools to find it that are only built to discover what we expect to find. You look for particles and you WILL find particles because the only (present) mechanism that you have that can compute the extracted information is built FOR particles. You can replace particles above with anything: waves, functions etc. I'm trying to say that maybe there's ALREADY too much non=physics stuff at the base of physics (preconceptions about what matter is, how it formed, how it's organized). That's not true, the essence of those particles is quantum mechanical in nature and is not treated for by physicists so simplistically. At the end of the day the standards model of particles physics is comprised of 13 particles and three of the four forces, we want to learn about those because hey, that might be important. We DO see things that don't fall into that, and many people do look in places where they very well might not see anything. and those preconceptions aren't arbitrary preconceptions, they are based off the cumulative knowledge of what we observe. If you find a model that matches reality in every way, then really whats the difference between understanding the model and understanding reality? In the beginning, God created.... If we all accept this fact, the debate will end. exactly, thank you for posting. it's depressing how many people cannot see that our nature as "spacetime entities", e.g. beings deeply embedded within the very fabric of spacetime itself, severely jeopardises our capacity to see spacetime with clear objectivity. and depressing how some people seem to think that universities are anything other than museums of historical thinking, guardians of the current paradigm (they have a vested interest in it). and it's even a bit of a shame that some people seem to believe there is really such a thing as "rigour" in an absolute sense. any concrete belief contains hypocrisy, e.g. is it "rigorous" to operate from the unquestioned fixed belief that "rigour" of and by itself automatically gives something credibility? can we please try to be reflective, in other words - isn't that what makes us human? r.e. the embeddedness of humans within spacetime, trying to look AT spacetime FROM spacetime is like taking the lid off an electrical multimeter, and using the multimeter to measure the electrical characteristics of *it's own* electronics. how can we know whether what we are seeing is the circuit, or the impact our measurement is having on the circuit? how can we meaningfully separate measurer and measurand? same deal, at a very deep level, regarding our structures of cognition (psychology) and going deeper - the very systemic fabric of our consciousness itself. the way out of this is to factor out the "measuring equipment", which in my opinion means both an intellectual study of psychology and spirituality, and a practical strategy for personal development to increase cognitive complexity and resolve "shadow" (e.g. withdraw projections from our interpretations). so to counter what some have posted here - can nobody please post here who has not yet had a satori (e.g. enlightenment experience)? it is only when you have, that your mind becomes "pure reflectivity", e.g. genuinely reflects the true nature of "4D" spacetime. @Cristian Baltatescu: Mathematical analysis gives us an OBJECTIVE view of reality, not subjective. The fact that anyone can do the equation and come up with the same answer and then do the experiment to test that answer means that these theories actually do correspond with reality. And no, you cannot replace particles with anything but particles. If a particle behaves like a wave, then we must think about them as both a wave and a particle, not just one or the other. These theories make predictions, and these predictions are testable. That is how we know they work so far. Some simple questions - not trying to jerk anyone's chain: what is a wave? What is it made of? Where is it's beginning? Does it have and end? "Mathematical analysis gives us an OBJECTIVE view of reality, not subjective. " is our actual experience of "objectivity" itself objective? you cannot take an objective relationship to "objectivity", e.g. put your consciousness under a microscope. this undercuts it's objectivity in an absolute sense, doesn't it? your position sounds like scientism to me, e.g. it sounds like you hold the fixed belief that only scientific claims are meaningful. there are degrees of objectivity and subjectivity, I tend to think a rigid mathematical framework that matches pretty well with what we see is more aptly called objective for the purposes of an outside observer with a bias in their opinion. I'm sorry, but you're talking nonsense. Math is not subjective. No matter what language you speak or what symbols you use to represent it, pi will always work out to the same value because it is the ratio of a circles circumference to its diameter. This isn't pushing scientism, it's stating a fact. Waxing poetic about consciousness is all fine and good but it doesn't help us understand the natural world because consciousness is absolutely subjective. In a way, I can't explain anything about the natural world to another person without math. It's completely universal in that you can stay here, and I can travel to the other side of the universe and if we both worked out the fine structure constant we'd both get the number 137.
you don't see that that's a subjective claim? e.g. prove it! give me the mathematical "proof" that MATHS ITSELF, e.g. the actual rational framework itself, is not subjective. "This isn't pushing scientism, it's stating a fact." but is THAT a fact? this assertion is another subjective claim. "Waxing poetic about consciousness is all fine and good"
this assertion is an example of itself. "because consciousness is absolutely subjective." oh right. so your consciousness of "objectivity" IS totally subjective then? do you notice how all of your assertions are affected by hypocrisy? e.g. your words considered as assertions and your words considered as *behaviour* do not line up. e.g. are showing a lack rational coherence! That's a common misunderstanding. Godel's theorem puts limits on what math can prove - it doesn't say that math is incorrect. In a nutshell, it says that there are statements you can make in mathematics that can neither be proved nor disproved. That doesn't mean that you can't know whether 2+3=5 or whether pythagoras' theorem is true or not. It means that there are some things that mathematics can't either prove or disprove. There are still MANY things that math can prove - conclusively. Maths works because all of the statements it makes are logically derived from a set of assumptions called "axioms". 2+3=5 depends on a handful of axioms such as "there exists a number called zero" and "every number has a unique successor"...2+3=5 is only a true statement about our universe if those axioms are true for our universe. However, the statement "If those axioms are true then 2+3=5 is also true" is a universal truth. Pythagoras' theorem is a great example of that. It depends on Euclidean geometry - which in turn depends on a few basic axioms, that there are straight lines, that parallel lines don't ever meet and so forth. One of those axioms basically says that the place where you're using these theorems has to be flat. If you draw a huge right triangle on the surface of the earth then the square on the hypotenuse most certainly DOES NOT equal the sum of the squares on the other two sides. That's not because dear old Pythagoras was wrong - it's because you tried to apply his theorem in a situation where the axioms on which it's based are not true. Euclidean geometry simply doesn't apply on the surface of a sphere. So what you need to understand is that Mathematics is "true" so long as you follow the axioms you set out for the statements you are making. Godel merely puts limits on what mathematics may hypothetically prove...it doesn't mean that math can't prove anything at all - and it certainly doesn't mean that you can' prove math mathematically - in fact one of the breakthroughs that Godel made in formulating his theorem was a way to use math to speak about mathematics itself. The way you are thinking is absolutely pointless. No matter what I might try to explain to you, you'll come back with some pseudo-philosophical line of reasoning about what really is subjective and objective. That type of reasoning is useless to anyone who is trying to understand the world around us, which is the goal of the sciences. Math is the language that we see when we need to put the world into concepts that we can comprehend. If you really want to argue that then I honestly don't know what to tell you. Math isn't some concept that someone came up with and then said "Right, now lets see if it explains reality". Someone said "Reality looks like this, lets devise a system of explaining what we see." Hence we have math, the language of everything. "No matter what I might try to explain to you, you'll come back with some pseudo-philosophical line of reasoning about what really is subjective and objective. " "That type of reasoning is useless to anyone who is trying to understand the world around us,"
Congratulations. You are a successful troll. Phil you forgot "and they all lived happily ever after", thats the proper way to end a fairytale. Since 2000 years ago humanity has struggled trying to find the objectiveness or connection with reality. Take any basic philosophy book … Plato, Descartes, Parmenides, Morente, Blanshard,… you name it, and you will quickly find that it is not so simple. With just a few basic tests you can quickly prove that your reality is mostly a fabrication. I challeng any one here to read plato then Kant, and post again that 2+2=4 is universal for any living being in the universe. And, if you are stupid enough to not understand why that is ridiculous, tell us why 2 + 2 = 4 and never 5. As I posted above, mathematics is the means to turn 'axioms' into 'theorems'. 2+2=4 is a statement about the arithmetic of numbers. It's a theorem...albeit a rather simple one. Like any theorem, it's only true if the axioms upon which it's been based are true. These "axioms" are statements that you boldly assert. Mathematics says "if your axioms are a true statement of the system in which you're working - then the following theorems are true". In the case of basic arithmetic, we do rely on some axioms - they are called "Peano axioms" - and you can find an article about them on Wikipedia. There are nine of these axioms. If all nine axioms are a true statement of our universe - then 2+2=4 is not only true - but we can construct a bullet-proof proof that it's true. So - if 2+2=5 then one or more of those 9 peano axioms is also false. These axioms are pretty hard to deny. "Zero is a number", "x=x", "if x=y then y=x", "if x=y and y=z then x=z"....and so forth. If you can deny that one of those axioms is true in some system in which you're working - then indeed 2+2 doesn't equal 4. Want an example? When I buy my wife a birthday present, a ring worth $100 is a better gift than a check for $100. In this gifting system, x doesn't necessarily equal x. It's no surprise then that giving her two gifts each worth $200 is not as good as giving her one gift worth $400. In this "wife birthday gifting" system, the ordinary arithmetic facts are inapplicable. That's not because math is 'broken' - or because 2+2 really doesn't equal 4 - it's not even because mathematics doesn't work in the realms of my wife's birthday preferences. It's because we tried to use a theorem (2+2=4) that's predicated on the truth of the peano axioms in a "system" where the peano axioms clearly aren't true because two gifts, each worth $100 are not worth the same thing. If x doesn't equal x then who knows what 2+2 equals?! However, these nine peano axioms are so obviously true for most things in our universe that we tend to forget to say "2+2=4 *if* there exists the number zero and *if* x=x and *if* x=y implies that y=x and....yadda yadda yadda". But in situations where that isn't the case, you have to come up with new axioms and set about proving new theorems. In the 'birthday gifting' universe, there are new mathematical statements to be made - but if you can come up with a solid set of axioms, you can use mathematics even in the weird world of gift-giving where 2+2 seems to equal somewhere between 2.5 and 3! For those with some philosophy of science background, is the argument more an instrumentalist account of physics or is it something akin to Fine's deflationary account such as in his Shaky Game: Einstein, Realism, and the Quantum Theory. I know Fine is attempting a middle ground between realist and anti-realist accounts but his solution is just an other variant of anti-realism. I've not read the essay yet since it is behind a paywall, but it honestly doesn't sound that new. And as others have noted a lot of stuff like this by physicists doesn't engage in a lot of stuff written in philosophy of science. Of course this is an essay more or less marketing their new book which is targeting a popular audience. So we shouldn't be surprised by that. "The fact that in general terms matches experiments proofs nothing, since you are testing your own fabrication… ( yes, time for example … )"
I personally think that subjectivity is the only way to understand what we can not explain, and objective attempt to explain what we can not understand. The main reason why Steven Hawking (and many other mainstream physicists) are giving up on a theory of everything, is because they continue to stubbornly hang on to their current particle/space view of the world. I think it’s time to think outside the box (and outside the mainstream) and take a serious look at some alternate theories. The fact that Quantum Mechanics and Relativity are two mutually exclusive theories, is strong indicator that they are seriously flawed. I believe that only theories that have a holistic framework will survive. Foamy Ether Theory provides a visual framework that describes the universe in terms of ONE substance. We need to spend less time developing crazy equations and more time building visual models. No consistent system of axioms whose theorems can be listed by an "effective procedure" is capable of proving all facts about the natural numbers. For any such system, there will always be statements about the natural numbers that are true, but that are unprovable within the system. If such a system is also capable of proving certain basic facts about the natural numbers, then one particular arithmetic truth the system cannot prove is the consistency of the system itself. "The fact that Quantum Mechanics and Relativity are two mutually exclusive theories, is strong indicator that they are seriously flawed." no - it's more fundamental than that. when we see things in reality which both appear to be true, and yet both appear to be "opposites", e.g. mutually exclusive, we are not seeing "erroneous theories", we are seeing "partial thinking". OUR partial thinking. we are seeing the (dimensional) limits of our own cognitive complexity. when we see such a paradox as 2 "true" mutually exclusive opposites, what reality is trying to tell us is that if we had an exra dimension of cognitive complexity, we could integrate both "partial truths", into a bigger, higher order picture systemic coherence. and this is not a hopeless situation, because actually (unlike any other animal) humans have the capacity to "evolve" extra cognitive complexity, should their survival situation depend on it. we all do this in our lives, we are born at an "Archaic" (un-reflective) stage of development, and in the first 20 years of our life, 3 successive dimensions of cognitive complexity will emerge. this gives us the cognitive baseline for "rational thought". in developmental psychology terms, this maps to dr robert kegan's "4th order" consciousness. it's possible to go beyond this point. someone who convincingly goes beyond this point, can acquire the capacity to integrate dualities such as quantum mechanics and relativity. i think i can outline the integration, to anyone who is interested. it seems to me that relativity is a "process" perspective of reality. e.g. it's taking a view that "ultimate reality" is process. whereas quantum mechanics is taking a "content" view of reality, it's taking a view that "ultimate" reality is content, e.g. "actual entities". of course, how can we talk about process unless we have some objects to weave process descriptions around them? and how can we talk about "separate entities" if we are not allowed to use a 4D spatial/process language to differentiate them as "objects"? so hopefully - it can already be seen that "content" and "process" are in a sense interlinked, as perspectives they actually create each other. we can regard emergent reality as a system of (infinitely deep) layered process. each layer of this process looks like process if you analyse it in isolation, but looks like an object from the perspective of the next layer up. an atom can be regarded as an "object" in the molecular zone. yet if we look at an atom - it's a process. woven around (sub-atomic) objects. if we look at these sub-atomic objects - ditto. so "objects" can be analysed as process sub-routines. thereby providing a door to a meta-theory which integrates quantum mechanics and relativity. "it seems to me that relativity is a "process" perspective of reality. e.g. it's taking a view that "ultimate reality" is process. "whereas quantum mechanics is taking a "content" view of reality, it's taking a view that "ultimate" reality is content, e.g. "actual entities"." I would under no circumstances say that this is a clear and obvious way of characterizing those theories. "thereby providing a door to a meta-theory which integrates quantum mechanics and relativity." I was worried you were serious until you got to here. Nobody would actually think that the spiel you gave before, even if it sounds good, can be 'easily' transformed into a predicative framework for learning about the universe in an empirical sense. and so on. all of these emerged sequentially in "time". obviously it does not "start" with Quarks, the process layer is infinitely deep. completely bottomless. i think it might be possible to derive a genuine "theory of everything" from this meta-perspective, with the caveat that the theory will contain recursion (e.g. contain itself in it's own definition in order to conceptualize discreet infinity). I also have not read the article, but this view was promulgated in the late 1800s by Ernst Mach, elaborated in the 1980s by little known physicist Fritz Rohrlich, and held and written about by many other physicists and philosophers of science. That said - perhaps the main point is that realism still holds sway in physics - that there is a theory or model that is ontologically privileged over all others (typically assumed to be a reductionist theory) - and it is time to abandon that position. If the article does not make any extravagant claims of novelty, that would be how I would interpret it. Someone said above that mathematics is not subjective, but objective, and that mathematics must surely represent REALITY because it offers results others can reproduce that. I understand what he wants to say, but to be hones not ALL aspects of mathematics are conform with what we experience as reality. Mathematics has long wandered into areas where it has become an (useful) mind game, true to itself, logical and all that, but not necessary representing reality. Not everything a mathematician imagines exists. What I meant in my original post was that using these kinds of tools (I know we don;t have other tools yet and I'm not proposing we should replace them with pseudo-philosophy ) will yield only one type of results. For example we might know there is such a thing as electricity, and we would only have access to a voltmeter and we would know SOME things about electricity and some things about the voltmeter. We would only be able voltage, right? There would be no (immediate) way of learning other things about said electricity and everything we would learn or deduct about it we would try to relate somehow back to that first experience of it, voltage. And that will give us what called a "subjective" view, for the lack of a better word. I could have used biased or limited or narrow, but my point still stands (at least Iimagine it does). Our current results ARE relevant, ARE coherent and in line with our science viewed as a cultural phenomenon , but they are STILL trying to fit something as elusive as reality or the universe into a hole of a certain (very simple) shape just because we don't know or don;t have tools to make holes of different shapes. I think we are still confusing very good provable lasting MODELS with REALITY. Ok, I'll admit modern physics has provided us with a very good model of reality. BUT there is no way to be 100% sure the model is perfect. And in the end I'll admit it doesn't even matter. I don't care, after all, If I'm in a Matrix-type of simulation or if atoms are an illusion as long as an illusory bullet in this world still kills me. So I shouldn't care if todays theories don;t offer a 100% TRUE theory of the reality as longs as it tells me that an atom bomb will kill me. I just want others to admit MODEL != REALITY, cos science is just modeling stuff as best you can. I hope that i am misreading Stephen Hawking when he says that we will never have a "theory of everything" to infer that we should just quit searching for it - what wonders we may uncover in that search! The essence of our humanity is to strive for the unattainable when all odds and logic indicate that we likely will not succeed - I think Einstein understood this. You'll find information inside those blogs (view all). yet everything in it's own theory in overlapping parameters is more likely. Converging models at one point yet not relevant at other points, numerous views of differing relevance dynamically interconnected with as many or more variables as perspective views. The key is not a theory of everything it is everything in a theory, the more views you obtain then the easier it becomes to see the object in which you seek. It is difficult to see the medium while emersed in same medium, as humans we have found disturbance to be a tool of enlightenment, such as particle accelerators,heat induction,etc. we kick the dandelion to see the florets/seedheads float about. Einstein ’s E=MC^2 is a private case of the above equation. The story of the formula inspired by the Ketoret is told at Introduction To Hebrew, Part One: The Ketoret. How is this for a Theory of Everything? It's simple - 0 is a multi part number. it exists in our reality as a quantity, but also requires a rewrite of the law of conservation of energy and also a change to 0 to be a multi part form. I live forever... So since both can not be true and I am here writing this the second must be correct. My life is infinite. Please check the math.... thanks. a) 100/infinity isn't zero. it's infinitesimal. b) infinity/0 is undefined (as is anything divided by zero). Since neither of these are true, everything you say falls to the ground. If the universe has an infinite span (which is by no means certain, by the way) - then your 100 year lifespan is an infinitesimal fraction of it. If someone lived for a zero amount of time - then we cannot express that as a fraction of the span of an infinite universe (or even a finite one for that matter). Sorry - bad math. Please tell whoever told you this so that this broken idea isn't propagated further. y'all mofos need Russell (Bertrand Russell, especially the 2+2 isn't 4 geniuses that apparently have no idea what the field of analysis is). <--- That's a joke, relax. Also, Paul, your infinity isn't a number and those aren't equations. You can't divide by zero or infinity in any analytic sense, they can only be viewed in terms of limits most often. I have been working on a theory of everything for a while now. It unites everthing together perfectly,the very big as well as the very small.I find no flaws in it and I have applied to multiple tests. However, no one in the scientific community including scientific organisations and universities want to hear my theory. Ironic isn,t it. The truth can be handed to them on a silver platter and they will throw it away in the closest garbage can because it does not come from one of their piers. Put your pride away and listen to the average science buff once in a while. They may surprise you with pretty good ideas. So basically we're back to the old "nothing left to discover" bit. How foolish to think the theory of everything will never be found - the future is a long time and the people who fill it will be a lot smarter than Steven Hawking. For what it is worth, I have apparently solved the so-called "theory of everything". It is very simple but the math-related to it is fantastic and possible use of this I am looking for sponsors/ commercial application. I can say that physics is "theory of every thing" = logic = objectivity. An experiment to test string theory?